The reception in the USA of the etchings by Auguste Brouet reflects an evolution of the tastes and the trends of the time. In the early XXth century, the period preceding the Great War is a passing ebb for the print market in America. The boom of the 1880s has long been over. Art merchants feel that a new strategy is needed and they work towards the education of the public in an attempt to revive and fuel interest in prints. Keppel, who launched the Print Collector's Quarterly in 1911 is probably the best-known among them, but he was far from pursuing this line alone. Another well-known american dealer interested in prints at that time was Edward Brandus. a color etching by Auguste Brouet, which seems to be a reminiscence of the Old Clothes Dealer in Saint-Ouen (Ba 81). In addition to his painting business, Brandus decided to build upon the success of the colour etchings which were not only published but also actively promoted by the Galerie Georges Petit in Paris. The First New York Salon of Original Etchings in Colors by Engravers of the Modern French School opened in April 1908 at the Brandus Gallery, on Fifth Avenue in New-York. The catalogue reflects the contemporary perception of prints and the print market: the introduction underlines how these limited editions, personnaly crafted and signed by the artists, and also endorsed an controlled by an official body, the Cercle de la Librairie, add to aesthetic qualities the appeal of sterling investment etc. It is in this context that we find the first mention of Brouet prints in the USA, a few original color etchings which were exhibited in the second edition of the Salon, in 1909. In this Salon, and in an exhibition held in Montréal the same year, the name of Brouet appears alongside artists like Chabanian, Le Riche, Luigini, Millière, Raffaelli, F. Simon, Waidmann. 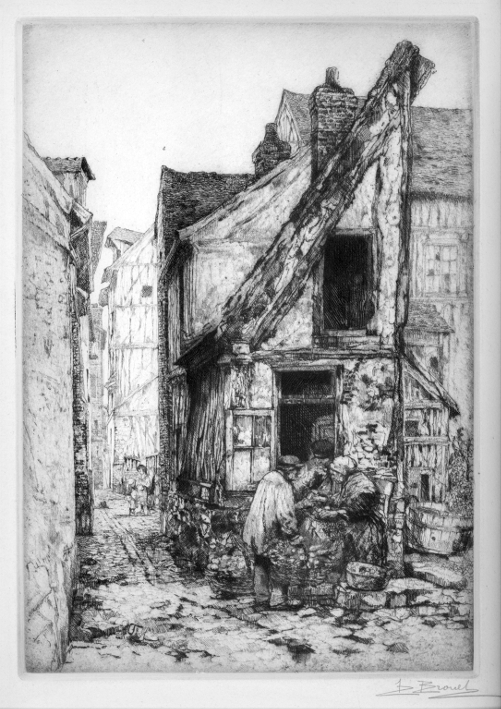 etching by Auguste Brouet published by F. H. Bresler, Milwaukee, 1912. Original color etchings were a momentary fashion. They befitted the time by providing attractive and original works of art for the classical taste with limited means. Initiated by the gallery Georges Petit in Paris, it found followers in Europe and across the Atlantic with galleries and art lovers ready to follow the trend alike. We note however that at the same period, and in parallel to color etchings, the same galleries were publishing etchings in black for the more select customer. In France, among a few prints in black by Brouet published by Galerie Georges Petit let us mention the peaceful Country Nook in the Damps. In Brussels, at the same time, Diétrich commissionned not only several reproduction etchings in colors but also a number of countryside motives in black, very similar in inspiration - and location - such as these Old Houses in Pont-de-l'Arche and several others. It is no surprise that we encounter the very same publication pattern in the USA. The F.H. Bresler company, a very active gallery located in Milwaukee, with a strong interest in color prints, also published at least one print in black by Brouet, the Old Street in Rouen and it seems others were considered for publication. This state of fact evolved in the 20s. With the fad for colour etchings over, the market was now avid of original etchings in black. Some energetic european art dealers sought ways to respond to this soaring demand for genuine works of painter-etchers. by Auguste Brouet, the proof impression of the publisher Etienne Bignou, signed by the artist and the printer Eugène Delâtre. The print is dated 1921. Significant attention focused on Brouet at that time. An early magazine article in International Studio seems to have been supported by Grignard. Somewhat later we find another article in The Print Connoisseur . Examination of the text and illustration suggests that this article was commissioned by Frédéric Grégoire. Yet another push came from the modern art dealer Etienne Bignou, who took over the Galerie Georges Petit and expanded his art trade activities in America with great success, up until the 50s. In the 20s, modern painting was not his only focus of interest. In association with Lefèvre (the Lefèvre Gallery in London) he also published more than twenty original etchings in black by Brouet. Active promotion in the USA followed, under the form of newspaper articles like these two articles published in American Art News in 1922 extolling the qualities of the etcher and his renown in a rather unrestricted manner . We can even suspect that it is one of these papers which initiated a dubious biographical detail: that Brouet was born in the circus milieu. And both papers are illustrated with a Brouet etching recently published by Bignou and Lefèvre. Similarly, the two Brouet prints cited (and for one reproduced) in Fine Prints of the Year 1924 have both been published by Bignou. Success came. The Pactolus flowed through his studio. America flooded him with dollars. He would draw negligently crumpled banknotes out of his pockets, where they lay next to his pipe here, his tobacco there. He used to say that his plate "Les Saintes-Maries" alone brought him 150000 Fr. US catalog of copyright 1921 p. 14735. This street was actually located not in Rouen, but in the nearby village of Pont-de-l'Arche. M. Valotaire, Auguste Brouet, Painter-Etcher, International Studio, 1920. Malcolm Salaman, Fine Prints of the Year 1924, London. [10"Le succès s'impose, Le Pactole, alors, roula dans son atelier, l'Amérique l'inonda de dollars. Il tirait de toutes ses poches voisinant là avec la pipe, ici avec le tabac, des billets de banque dédaigneusement froissés...La planche Vers les Saintes Maries lui aurait rapporté, de son propre aveu, cent cinquante mille francs." J. R. Thomé, Atalante, janvier 1942, 2.